But now that I’m older, mentioning the word “competition” coupled with a friend’s name is like waving a bloody slab of meat in shark-infested water. 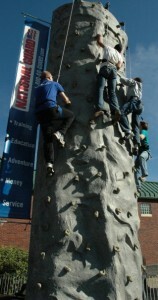 Case in point: deciding to compete with some of my UNCASG folks in a rock wall climbing competition before Saturday’s football game, even though I’d never climbed a rock wall in my life (I came in 4th of 4 ). Law school is no different. Madame Prosecutor and I are already teaming up for the American Bar Association‘s Client Counseling Competition even though it’s entirely dominated by 2Ls and 3Ls. Then earlier today I got an email announcing that it’s the last day to sign up for a 1L oral argument competition sponsored by Kilpatrick Stockton… and nearly half of my section is already signed up.